Hand-made bracers are made of waxed leather 3.5-4 mm thick. They are fastened with leather belts with brass buckles on the arm. Relief is tooled on the leather. Colour of leather can be black or brown. Simple steel rivets and burrs are painted in black. Together with spaulders, cuirass and mask, these bracers make full LARP-armour. Gloves are not included to the price. Segmental spaulder is made of waxed leather 3.5-4 mm thick. Leather belts with brass buckles are fixed across on the chest. Steel plate is riveted with black rivets and burrs to the belts. Pattern on plate is embossed. Please send the wished draft of embossing to us [email protected] Price includes one spaulder. ..
Segmental spaulders are made of waxed leather of 3.5-4 mm thick. They are fastened with leather belts with brass buckles. Parts of spaulders are riveted with rivets and burss, coloured in black. Relief is tooled on the leather. This model of spaulders creates full LARP-armour together with bracers, cuirass and mask. If you want any amendments to be made in this model, please contact us [email protected] ..
Hand-made belt is an accessory of Thorin Oakenshield, well-known character of popular book and film "Hobbit". Belt is made of leather of 3.5 thick. Ouch is plastic one, and is painted in golden colour. Pattern is tooled on the leather. Together with bracers and spaulders of similar design, this belt will help you to create wonderful character of dwarf! 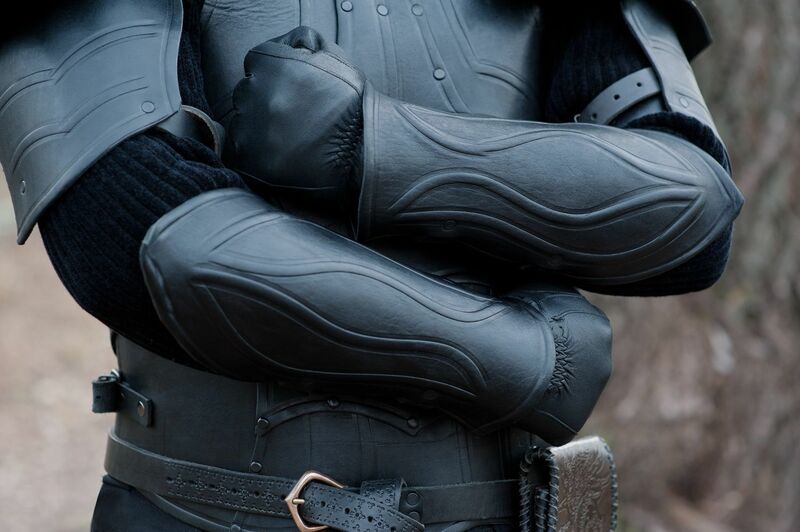 ..
Leather bracers from armor costume in style of Bëor the Old. This light arm protection has base of flexible leather. We offer black, red or brown leather for base of your bracers. Long plates are made of firm croupon leather and riveted to the base. Belts on the inner side of bracers allow good fitting of protection. Despite of bracers are made of leather, they protect limbs not worse than a steel armor. You may complete you body protection with leather cuirass, made in the same style. ..
Spider leather bracers of Umbar merchant When a good man buys armor from Steel Mastery, we are always glad to do our job. 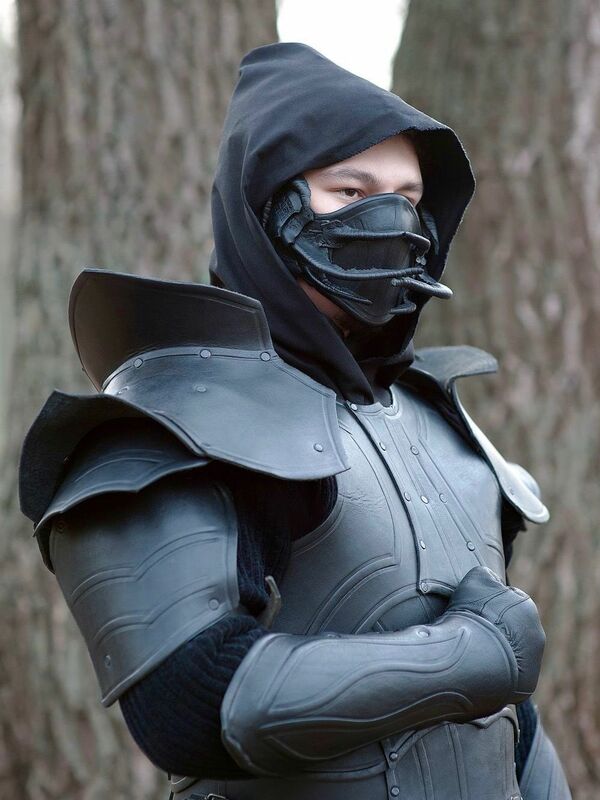 And, when satisfied customer decides to complete this armor kit, we are over the moon. Such a situation with these bracers. When business man from respectable Umbar family assured, how good his armor is, he decided that he is missing only these bracers for full happiness and unspeakable beauty. Look at them by yourself and you will definitely understand such person. Thick leather of bracers is so robust, as walls of Minas Tirith; so silky, as virgin’s skin and so soft, as swan’s dawn. Belts are so solid, as walls of town’s dungeon and so elastics, as bow-string of elf’s bow. Buckles and rivets look richer than King under the Mountain. Gosh, what a bracers! We would wear them by ourselves. But, a good man ordered, so how can we deny a good man?.. ..
Leather vest and bracers in Renaissance style When the night floats on the Venetian canals, slouching in gondola, and serenades of the most steady Romeos calm down against palazzo walls; when only night birds’ calls are heard in the silence, and only the cats who skitter with velvet treads down the narrow streets and wide squares. When the city of enamored people, thieves and merchants falls into a sleep… Only then, noble men of Venetia, full of icy nerves and consumed with desire of honor, are getting ready to resolve disputes that cannot be resolved in daylight in front of bystanders. Honor is a reason of disputes and death of one of disputant is a result. 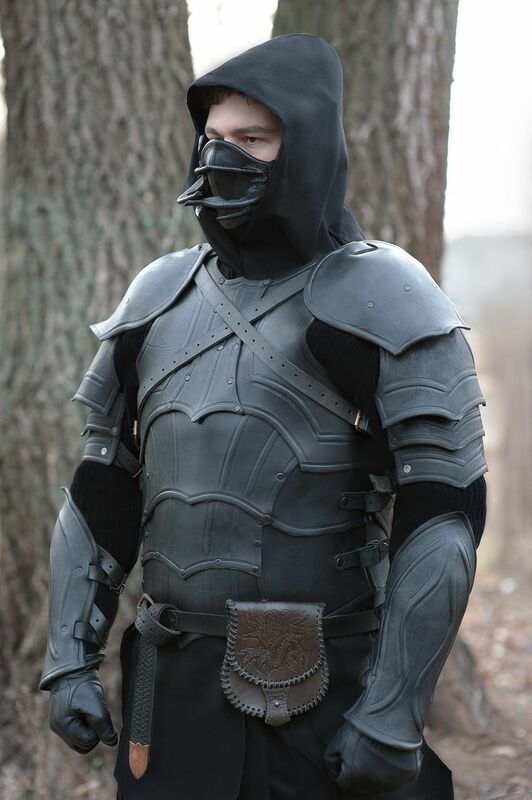 Just for that delicate pursuit of the noble Dons, Steel Mastery made this leather armor costume. Linen is too plain material, cotton is too soft, wool is too comfortable, silk is too sensitive and steel is too rough for such delicate issue. So, only leather, chaste black leather with plain drops of steel rivets is appropriate for medieval leather vest, in..
Leather bracers in Renaissance style What is the most part to be protected in a combat? We mean not a vulgar scuffle and not a grand battle, but an affair of honor. “A heart”, one will answer; “A neck”, will smirk another; “A liver”, will confidently shake a head the third. And, only few will answer: “Arms”. Oh! First three wise men have the point without any doubts. As there are no chances to survive if a cold point of a sword pierced through the heart, neck or liver. However, it is not possible to continue a fight even though that trinity is intact, but there is nothing to hold a weapon. So, there is one more substantial answer – arms. For those, who know the forth answer, we created these functional leather bracers in Renaissance style. 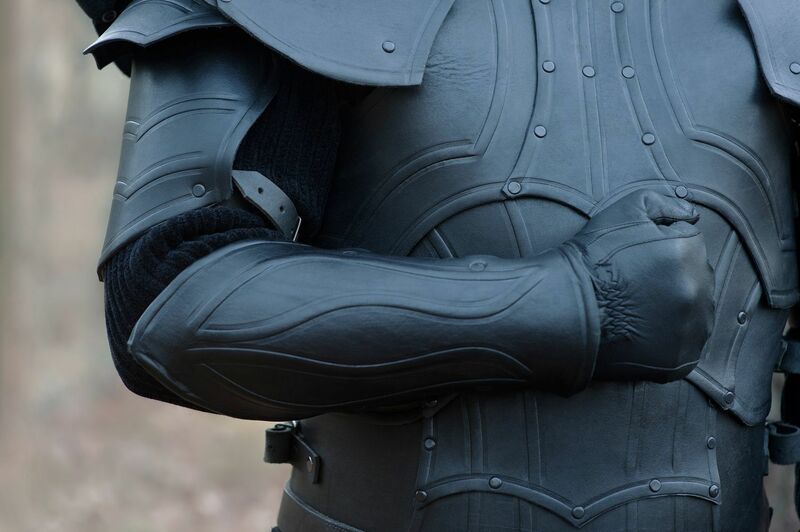 Simple and reliable real leather armor will protect your forearms of stray prods and cuts, and their plain and decent design will adorn your armor costume. Preparing for a dueling, do not forget to take leather bracers. By the way, Steel Mastery will happily make it of leather and metal..